That tweaky guy on the ferry was on Northern Exposure for a while, as part of a very positive, normal, funny gay couple. I got distracted by my memory of that, reminiscing about my enjoyment of that show. I agree. I thought the Harvey Two-Face make up was AMAZING. I kinda figured that CGI was involved as well because there were a few intricate things that the make up couldn't do in order of showing a severely burnt flesh on the side of some guy's face. Plus, I find Two-Face frightening than the Joker believe it or not. Yes, those Joker-homemade-video scenes were very effective! When he roars LOOK AT ME it's like — whoa. Aaron Eckhart's Two-Face did something similar: saying something and then ROARING SOMETHING (pretty well too). But when Heath/Joker did it — that took the cake. Speaking of the auditory stuff: I loved it when the soundtrack suddenly faded to silence (in the aerial shot of the Harvey Dent police convoy and when the Joker hung out the squad car window). Great atmospherics. OT, but I just watched The Bucket List on TV and saw a nearly unrecognizable Rob Morrow playing a small undistinguished part as a doctor. It was kind of shocking to see the star of a once popular, quirky series playing a role that really could have been played by anyone. The only thing in common with his NE was that both were doctors. On the Two Face face question, I think it has to be CGI. It's very amazing, whatever it is. I was expecting to be freaked out by it because my usually pretty stoic son warned me that it was really gross. Consequently, it didn't bother me but kind of fascinated me. I thought the Two Face foreshadowing -- Harvey Dent's prescient lines, plus the two-faced coin (and speaking of No Country for Old Men, that makes two movies in which villains flip coins to determine their victims' fates!) -- was one of the most interesting aspects of the movie. As yucky as the **bblleegghh!!! ** version of Harvey Dent is... one of my favorite scenes in the whole movie was the extended conversation that the Joker has with him in the hospital. I loved the way the Joker described himself as a dog chasing cars... and if he ever caught one he wouldn't know what to do with it. I also loved all of the scenes where the Joker was in custody (the fight/conversation with Batman, the discussions with various cops, clapping at the new commissioner from inside the holding cell... all of those things were brilliant I thought). I'm going to go back to my question from a while back... do you all think that the Joker's brightly colored socks (that we see clearly when he's sitting on the floor in the interrogation room) were meant to be self-referential for Heath in a silly way? And, about the fake-Batman in the noose... yep, that seems to be a perfectly crafted moment to make the whole audience jump. Even when you know it's coming, you can't help but jump. I think the music... the really abrupt music, plays a huge role in that effect. do you all think that the Joker's brightly colored socks ... were meant to be self-referential for Heath in a silly way? No idea. Seems like the only way to get that answered for certain would be to ask the filmmakers — if they ever do a Q+A or something . . . I loved the "Harvey Dent" sticker on the uniform. Hilarious! I'm guessing it's more of a coincidence. I mean, the Joker traditionally wears purple and green and pattern on pattern; of course he would have unusual socks! Re: Matilda. Truman told me he also heard that the name tag said "Matilda". 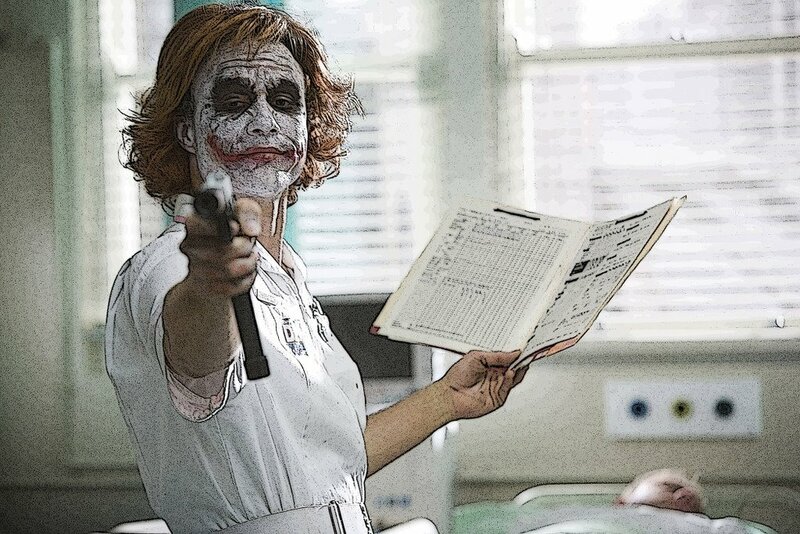 He also remarked that the Joker as nurse looked like Reba on a bad acid trip. hehe, so hilarious when he finally got the detonator to work and tripped out of the screen with a flip of his dress! Yeah, the fact that he startled himself with that detonator was a brilliant little detail. OK... so, who here thinks that the guy in the semi-truck with the cowboy hat might have been a gentle/loving nudge towards BBM? (In much the same way as, say, "the big ice storm" line in BBM was possibly a reference to Ang Lee). So, instead of doing what I had planned on doing today, I ended up looking through some lengthy and seriously dedicated TDK fanpage. It's a weird experience, watching a new fandom going gloriously full blast, in those early stages where everything is so overwhelming and everyone are having so much fun. Even though I haven't seen the film yet, I've been sitting there LOL'ing and grinning and just generally shaking my head. So much creativity... so much amazing fangirlishness/fanboyness - for the film and some of the actors - mainly Heath and CB, - so many wonderful swoony pictures, so much general craziness, so many funny fandom injokes, so much utter irreverence.... I won't even get into what they've dubbed Heath by now. But I can't help just laughing, and I think Heath would have done so, too. And so many spoilers, by means of clips, mostly. Joker clips. I bet I must soon have seen the entire Joker part of the film, just from clips. I've certainly seen that whole pencil incident by now. And it's strange to see that Heath finally has made it with the fanboy crowd - noe they're posting all the images that have ever been seen over here at the HHH thread... and oooh'ing and aaaah'iing and swooning mightily. But anyway, they're taking every possible pop culture reference and actor gossip tidbit and running with it, using all their photoshopping skills in the process, and it was when I saw this one that I knew I had to come back here and post. ETA: I did remove the image, based on Amanda's post, though unbeknownst to me Photobucket saw fit to re-instate it when I somewhat later re-uploaded it to my account after having deleted it. Anyway, now it's back, because I refuse to yield to verbal abuse the likes of which is found in one of the posts commenting on this image.